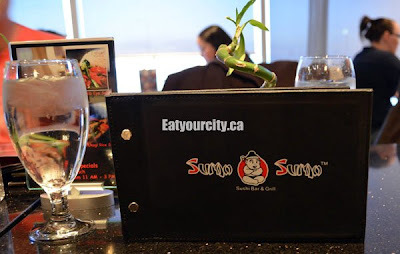 After hearing some good things from friends, we gather up a large group and head to Sumo Sumo, a bustling and busy place out in Sherwood Park. Greeted by a cute cartoon sumo wrestler and fun decorative touches against the red traditional door, black. red and bamboo motifs, its well lit and noisy environment seems like a good start. Servers are efficient, though a bit harried - most of the tables in the huge dining room area was packed and there was always people waiting to be seated. We ordered way more food than could be photographed before people dug in, so enjoy! After perusing through the menu, we decide to go with several different fusion rolls, some sushi boats (or in our case a couple bridges) and some random things that appealed to us. There was a drink menu with various cocktails, but tonight, we're here for the food! First up is the Mexican Roll. 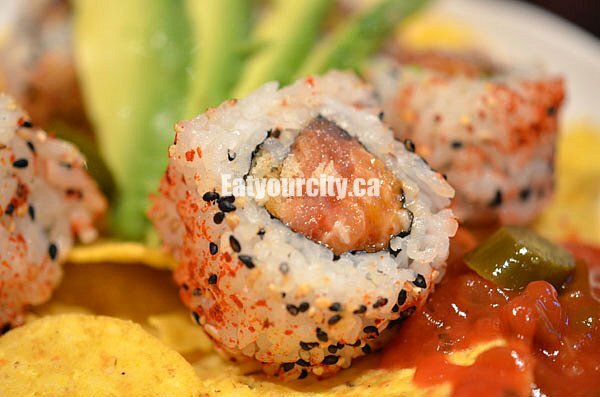 Spicy salmon and tuna along with green onions and fried panko crumbs, is rolled up in seasoned sushi rice, and garnished with sesame seeds, avocado and tortilla chips with salsa. 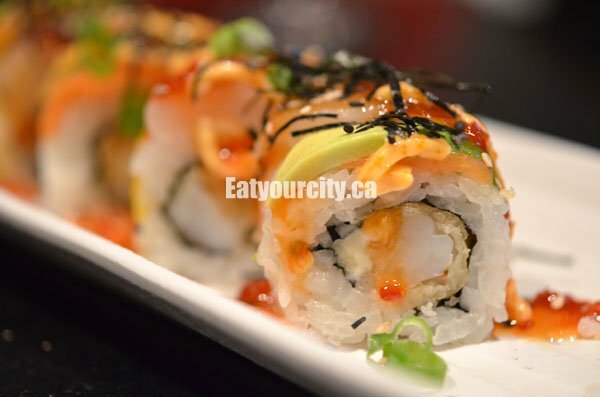 Its a different way to serve the stereotypical spicy tuna roll and is tasty. 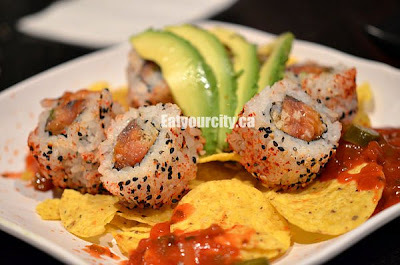 We originally thought the ripe avocado would be rolled up inside the roll, but it was served as a garnish and you can add as much or little to your bite. We picked at the chips and bottled store salsa while the other dishes came. Next up was the Joe's Special roll. 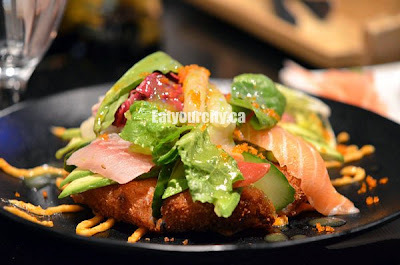 This one consisted of crisp shrimp tempura, small slivers of smoked salmon, scallop, mango, avocado, green onion, a good squirt of masago mayo, with a garnish of sweet chili sauce, nori and sesame seeds. 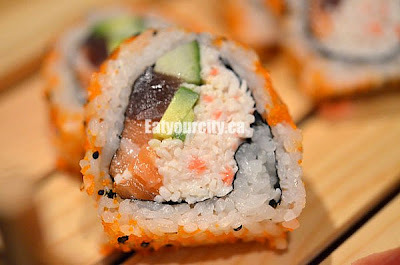 While tasty, the smoked salmon and scallop flavours are lost partially because of the small amount placed on the roll, and partially because of the sweet chili sauce masking the flavours. The mango used was surprisingly sweet and ripe (many places use unripe as its easier to slice) and worked well with the sweet chill sauce. One of the favourite rolls of the night. Next came our sushi.. bridges! Turned out our tables ordered a couple of these.. oops. Oh well. 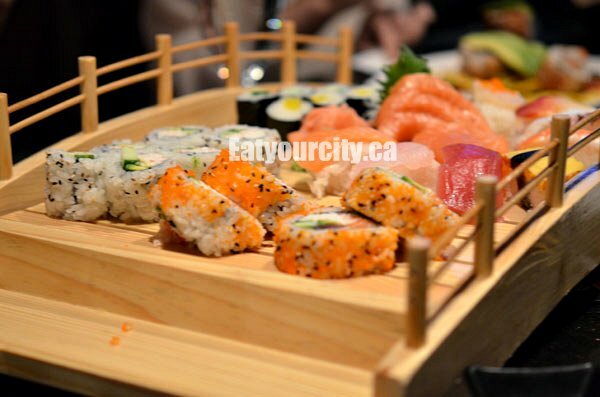 The Tokyo Bridge included an assortment of Sumo rolls, California rolls, futomaki, kappamaki, oshinko maki, assorted sashimi and sushi. 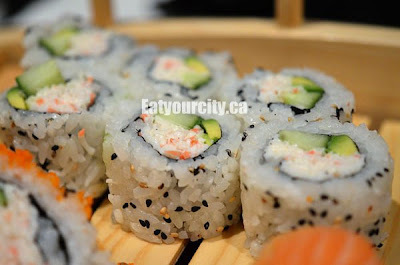 The Sumo Roll was another favourite of the night. Filled with salmon, tuna, a ridiculous amount of crabmeat, cucumber, avocado, masago and toasted black and white sesame seeds. You can't tell from the picture, but all of the rolls are massive - 3inches in diameter. It was difficult to taste everything in 1 bite - 3-4 bites was more realistic. The addition of freshly cracked ground pepper made it stand out from the standard California roll. The addition of black pepper got mixed reactions - some liked it, others didn't. Unfortunately, while most of Sumo Sumo's rolls were tasty and well executed, they fell flat in the sushi department. Oddly, while the maki rolls were made with seasoned (albeit a bit too moist) rice, the rice used in the sushi component was completely unseasoned! To top it off, the tuna and hamachi topping the sushi was extremely fishy and definitely not fresh. The salmon, octopus, surf clam and scallop was passably fresh. But to put unfresh seafood on bland unflavored rice? Ugh. Rolls are definitely their forte. And because we liked the Sumo Roll, we ordered some more, along with the Samurai Roll. The Samurai roll was very similar to the Joe's special roll, with the only difference being it had shrimp, crabmeat and scallop tempura (instead of just shrimp tempura), making for a lot more seafood in the Samurai vs the Joe's special. They forgot the sweet chill sauce with the Samurai roll, but it wasn't missed. Next up was the Sashimi Pizza. A panko encrusted deep fried sushi rice "crust" is topped with various pieces of sashimi, lettuce, a tangy in house dressing and crisp salty-savory masago. Strangely, the rice "crust" was very thick, and unseasoned, but the dressing helped pull things together. A much thinner crust would have improved the dish as while the crunchiness was nice, the overwhelming amount of bland rice diluted out everything else. 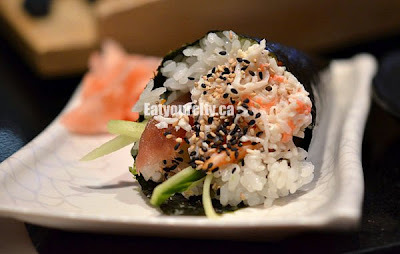 The Sumo Cone was packed full of salmon, tuna, crabmeat, cucumber, avocado, masago mayo and toasted black and white sesame seeds. Everything we liked about the sumo roll, but in a handheld package. As we sat back, digested and chatted, we forgot to take pictures of the desserts some of our friends that still had tummy space had ordered. I recall they were prettily plated and looked like maki rolls, but not a clue what they were. 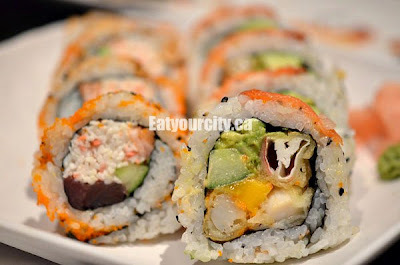 Overall, a good place to go for tasty fusion style rolls! We'll be back for the rolls, but here is a lot of work to be done in the sushi department before we'll be back for them. Not sure if it is an issue of expectations or what not but, based on the description of rolls vs rest, this would be a place I will give it a pass. My belief is that maki/rolls are things pretty much anybody can do. While that is fine, the major issue is that it can more easily "hide" lack of skills by overdressing and covering things. 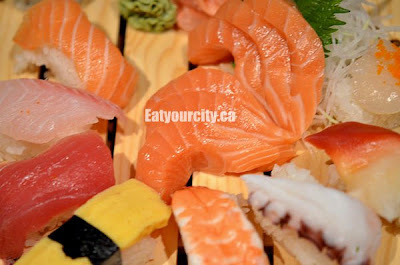 That is not something you can do with sashimi or nigiri sushi. If I am going to pay premium, hey, better give me something "good"! In landlocked Alberta, sometimes we get what we get - I wouldn't mind heading back for just the rolls - flavorwise, some of them were quite good - and if there's lots of sauce to mask and "dressup" - well, those are trademarks of "fusion", and we should expect that. They're not aiming for traditional, so we shouldn't expect Traditional styles and "rules". The sushi was a bit hit and miss - 2 tables out of 3 had seasoned rice in their nigiris, and some of the seafood on the nigiri was fresh, others - not. One observation, one question: 1) Since most seafood sold in North America is flash frozen at sea, I will only partially buy the "freshness" side. Instead, we should look at the consumption rate from the local population. 2) Money-wise, how much was the damage here compared to your favourite Wasabi? Hmm.. just counting the rolls and sushi we had on our table - discounting the sushi pizza and cone which I sampled off another table, and other fare my other friends ate, for 4, it worked out to be just over $90 before drinks, dessert, gst and tip. Other tables spent more since they ordered simular amounts of rolls and bridges as well as dessert.